Empire: Born the son of poor black sharecroppers, Navin Johnson sets off to seek his fortune in the big wide world. Initially he doesn't get further than the end of the fence, but eventually he finds employment at a gas station, becomes the target for a crazed psycho-killer (the splendid M Emmet Walsh), finds out about his "special purpose" from a female circus daredevil motorbike rider, realises true love with Bernadette Peters, and finds fame and fortune through his brilliant invention, the Optigrab. 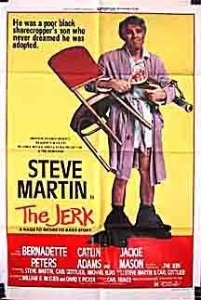 Roger Ebert: I can report, however, why I didn't find “The Jerk” very funny. It began to grind on me right at the beginning because it was depending on whats rather than whys for its laughs. I'll explain. It seems to me that there are two basic approaches to any kind of comedy, and in a burst of oversimplification I'll call them the Funny Hat and the Funny Logic approaches. The difference is elementary: In the first, we're supposed to laugh because the comic is wearing the funny hat, and in the second it's funny because of his reasons for wearing the funny hat. You may have guessed by now that I prefer the Funny Logic approach, and that “The Jerk” is almost entirely a movie of Funny Hats. An example, from the film's opening premise: Steve Martin has been raised as a member of a family of poor black Southern sharecroppers, and, although he is white, it has never occurred to him that he might be adopted. His life is happy until the day he learns the truth, and is sent out into the world to earn his way. He hits the road wearing a World War II bomber's helmet and goggles. OK. “The Jerk” wants us to laugh at this material just at the most basic level. Martin is white and thinks the blacks are his parents, ha, ha. He wears a funny hat when he hits the road, ho, ho. Those are the whats. What about the whys? Why is he wearing the goggles? So we will laugh. There's no plot point to be made, and nothing is being said about his character—except, of course, that he's a jerk. I've been quoting "The new phonebooks are here!" at work on new printed directory day for the past twenty years. Nobody ever gets it. I think next week I'll be able to send more money as I may have extra work. "Son, you gonna be alright." Here's Steve Martin introducing the film for AFI in 2008. Virtually any impromptu list I am verbalizing ends in "and this lamp." I still use "I was born a poor black child..." all the time. Although the crush solidified after my first viewing of "Sunday in the Park With George", it had its origins in my first viewing of "The Jerk". Whatever she's in, Bernadette Peters is transcendent. This kind of broad absurdity is golden era Steve Martin. This was the first of a kind of amazing run with Carl Reiner as director, followed by Dead Men Don't Wear Plaid, Man With Two Brains, and All of Me. All great in their own ways, and pretty distinct from each other.